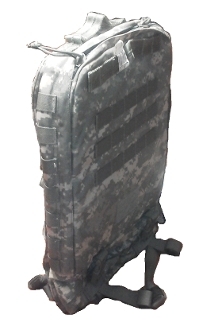 The M-9 Assault Medical Backpack from Tactical & Survival Specialties, Inc. was specifically designed to better fulfill the needs of the operational medic involved in vehicle or aircraft operations. The problem with conventional medical packs is the bulk and thickness of the bag interfering with the medic’s ability to sit or move in vehicles or aircraft. The M-9 was designed and created with the guidance of a Physician’s Assistant (PA), who also served as a Special Operations 18D medic, to provide a backpack with a very thin profile that carries the necessary medical support items for operational medics.